Ellen Donovan died, her plaque tells us, because she 'rushed into a burning house to save a neighbour's children and perished in the flames'. 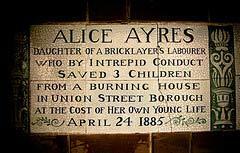 She is just one of the everyday heroes commemorated in the Watts Memorial, which lies in Postman's Park north of St Paul's, and is the subject of a new book by King's College historian John Price. Some of us may have stumbled across the memorial - a series of simple ceramic tiles under a wooden roof, tucked in one corner of an unspectacular park - while wandering through the City of London, or know it from the film "Closer". But few of us would have realised it was part of a much bigger project by the Victorian artist George Watts. He wanted similar memorials erected across the country to pay tribute to ordinary people who died trying to save others, hoping this would inspire working-class people to follow suit and thus become better citizens. That might seem patronising to us today, but the memorial is still evocative, as Price notes. The simplicity of the descriptions of those who gave their lives saving others, stripped of the embellishment and melodrama so often favoured by the Victorians, is hugely affecting. And it is like that because, as Price makes clear, Watts very much wanted the focus to be not on the artistic value of the memorial, but the act itself. This memorial to 'heroic self-sacrifice', as Watts named it, often seems sad to those who see it, and the story behind it is a sad one, too. Troubled by ill health in later life, Watts may never in fact have got to see the memorial he worked so long to create. In a sense, too, it came too late. Had the memorial being built in 1887, when Watts first put forward the idea, it might have ridden on a tide of popular sentiment and been taken up across the country. But by 1900, the world had become far more questioning of notions like heroism; and so the memorial remains, as Price puts it, the last great flourishing of a very Victorian sentiment.